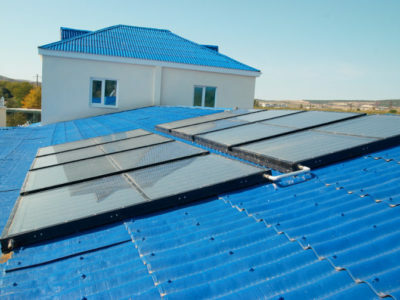 Solar hot water panels, also known as solar thermal panels, are fitted to your roof to collect heat from the sun and use it to heat your water, which is stored in a hot water cylinder. You can use a boiler or immersion heater as a backup to further heat up the water to reach the temperature you want. Evacuated tube solar panels are the most efficient, with a conversion efficiency of over 90%. They are made of a collection of glass tubes, each of which has a small tube inside, which is coated with a selective light absorber. Flat plate collectors have been around since the 1950s. They are made up of a flat plate absorber with an insulated cover, a heat transferring liquid containing antifreeze and an insulated backing. To get prices for your solar hot water project, get quotes from up to 4 local installers. How do solar thermal panels work? 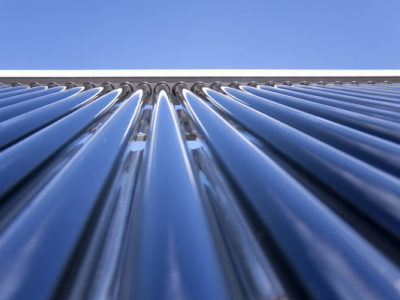 Are there different types of solar thermal panels?